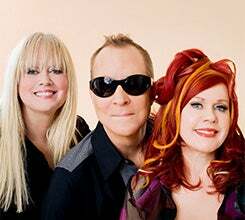 Nearly 40 years and over 20 million albums into their career, The B-52s remain one of rock music’s most beloved and enduring bands. From groundbreaking songs like “Rock Lobster,” “Dance This Mess Around,” and “Private Idaho,” to chart-topping hits like “Love Shack,” “Roam,” and “Deadbeat Club,” their unforgettable dance-rock tunes start a party every time their music begins. Formed in 1976 and named after southern slang for exaggerated bouffant hairdos, The B-52s’ thrift store aesthetic and genre-defying songs were the talk of the post-punk underground. Over time, they created a lexicon of songs and styles that would set the standard for the development of the alternative music scene for the next decade. The B-52s’ influence cuts a wide path through much of modern rock – from the low-fi efforts of nouveau garage bands to the retro-hip of ultra-lounge, to the very core of dance music itself. "We just did our own thing, which was a combination of rock 'n 'roll, funk, and Fellini, and game show host, and corn, and mysticism," says band member Fred Schneider.